Our last post was on a method to embed Windows media player in websites /blogs to access online radio and TV stations .There is a Firefox plugin that does the same thing by creating a browser Window . It uses Windows media player browser plugin to stream more than 2000 live TV stations arranged on country basis . 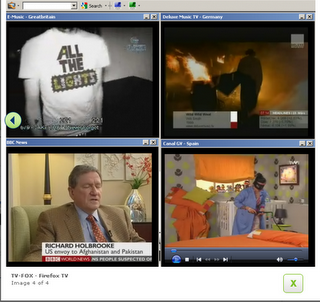 Watch online TV on Firefox using TV-Fox addon . If you don’t have Windows media player installed , you need to get the plugin here .TV-Fox has the most updated online TV database . So with this Firefox addon , You don’t need to buy any additional software to watch live online TV . Another feature of addon is the inbuilt search engine for quick access to Wikipedia , Google ,torrent files etc . We noticed some crap channels which always buffer but never load .Exception to news channels like BBC ,CNN etc. are always available . Download TV-Fox to Watch online TV on Firefox .